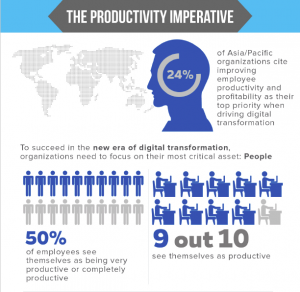 Employees—more productive, more profitable ones—are at the center of most digital transformation initiatives across Asia-Pacific. But, it seems that employers still don’t fully understand what motivates what are increasingly their most important assets. According to the results of a recent IDC white paper that we commissioned1, the countries with the highest job satisfaction also have, perhaps paradoxically, the least loyal employees. What other surprises are in store? Regardless of where a company is based, workforces now span many time zones and cultures. It’s important to understand how much—or, how little—the employee engagement landscape differs by country in the economically vital, and vibrant, Asia-Pacific.